Linking up with Jenna and Anne today for a little snapshot into life currently. Be sure to visit their pages and see what other bloggers are currently doing and read on to find out what I’m currently wishing, remembering, wrapping, baking and decorating! Wishing | I was back in college, but not for the reasons you might think! I actually quite like being out of college, but still young(ish) however, the Maryland basketball team is just so, so good this year that I am wishing I still had my free student tickets, could walk from my dorm to the games and could go out and celebrate at the bars afterward. They lost to UNC last night, but it was still a great game and I know there is just more excitement ahead. Luckily, we’ll see them in a couple of weeks when they come to Baltimore to play Princeton at Royal Farms Arena. Remembering | past holiday parties and preparing for this weekend. 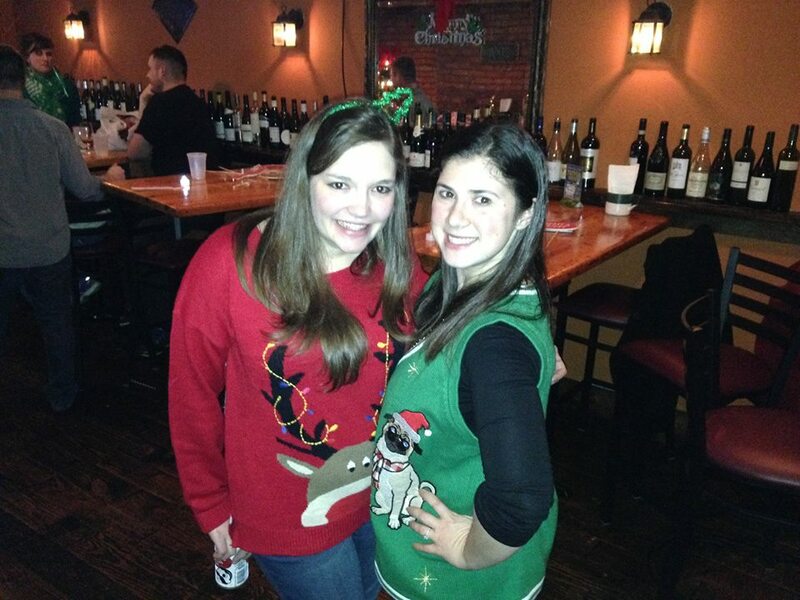 Jeanette and I have thrown an annual holiday party since our sophomore year of college. It started out as a Pilgrim and Indian theme party where everyone wore costumes and has morphed into a holiday party where we still encourage guests to wear wacky outfits. Last year, we reserved the upstairs bar at Brewer’s Cask, had mistletoe and photo booth props and it was a ton of fun. We’ve switched the location this year and have a ton of decorations and fun prizes for the best outfits. I’ll be sure to let you know how it goes! Wrapping | Hanukkah gifts! The eight crazy nights begin on Sunday and I’m looking forward to a holiday get together with my mom and cousins. Gimme those latkes! If you are still doing your holiday shopping, be sure to check out Jeanette’s Favorite gift shops in Baltimore and my favorite gift ideas. Baking | Christmas cookies! My Grandma always had tins of fresh cookies ready for us every time we visited her house on Long Island for the holidays. She is Italian and seemed to have the BEST cookie recipes like these Cream Cheese Spritz Cookies that I’m going to try to attempt this year. Decorating | the house for the holidays. Is there a different answer for this one? I grew up celebrating Hanukkah and Christmas and while we never had a tree or Christmas lights, I’ve always loved putting out a few festive decorations and burning holiday scented candles. What are you currently wishing, remembering, wrapping, baking or decorating? Your annual holiday party sounds like so much fun!! I love that you’re in Baltimore. Have y’all always lived there? My best friend has lived there for about 5 years now and I’ve been up to visit a few times and love it. I grew up in DC/Virginia and made the move to Baltimore just a couple of years ago. I really love it so far!